This steel cut oatmeal recipes has restored my faith in oatmeal. I’ve never been a real big fan of plain oatmeal. Or cinnamon raisin oatmeal. Or any kind of oatmeal. Even back in the days when I’d not feel a whit of guilt loading it down with brown sugar, raisins, cinnamon, cream…anything I could think of to add a little flavor. It always just seemed sort of bland to me. Which is sad, because it’s SO affordable, and SO quick to make. 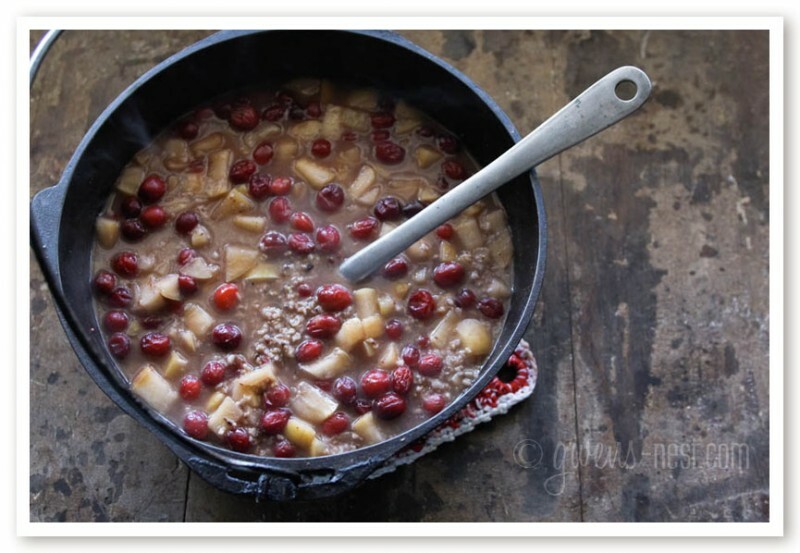 But this cranberry oatmeal recipe that I found last year from Water On The Floor blog was a game changer for me. I fell in love with the tart and sweet flavor combination, and all of the sudden I need oatmeal in my life. 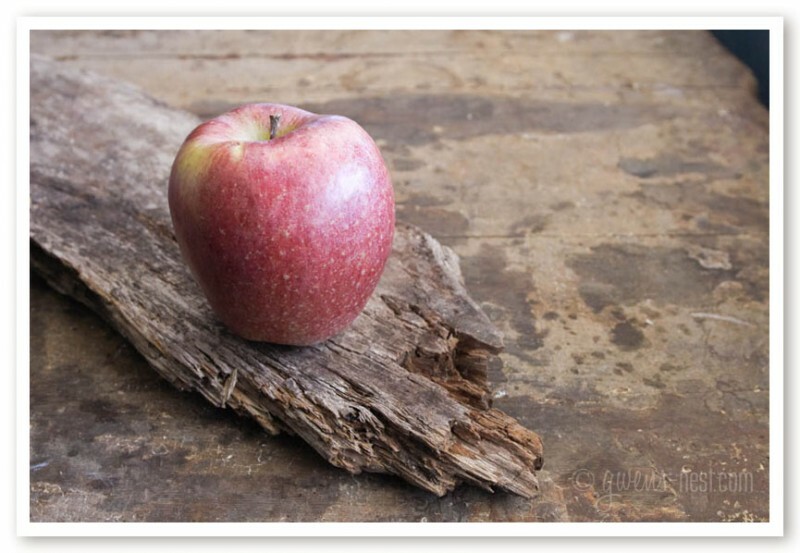 Especially in the fall, when the crisp sweet apples are being harvested in the mountains of north Georgia. 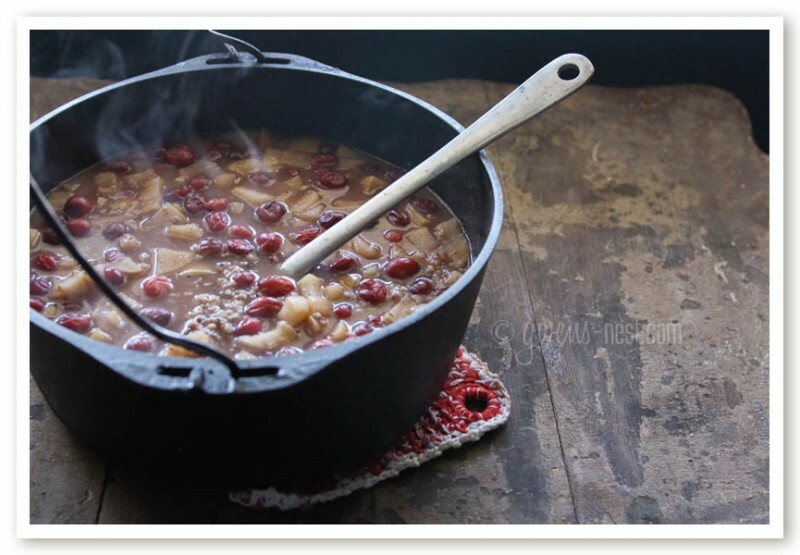 The original recipe is a crock pot version, but I never have great results using the crock pot, and besides…it really takes about 30 minutes on the stovetop to make a HUGE batch that I can reheat for several days worth of breakfasts. They’re not rolled or flattened like the old fashioned oatmeal that we’re used to, so they take just a little longer to cook, but the result is a toothier, heartier textured bowl of oats. I find steel cut oats are most grocery stores now, and also at Aldi’s. If your preference is regular old fashioned oats, I will give you a variation in the printable steel cut oatmeal recipe notes below. 1 tablespoon of Trim Healthy Mama sweet blend or several packets (6-8?) of your favorite sweetener, or my brown sugar sweet recipe with some added stevia to make it sweet enough. My preference on sweeteners is the Trim Healthy Mama (Super) Sweet Blend since it’s so economical- only one Tablespoon sweetens this entire pot! I adore their stevia as well. You can find these and all of their top quality and affordable products through my affiliate link to the Trim Healthy Mama store. This step is *totally* optional. But I really like some depth of flavor when it comes to oats, so I opted to toast the oats just a bit first. It takes just a couple of minutes. I heated my pot on medium heat, and melted a teaspoon of butter until it sizzled. Then I added the oats, stirring frequently just until they were toasty brown with a nutty smell-but they burn quickly, so don’t get busy with anything else! Maybe you’ve heard of “soaking” and it sounds like a hassle. It really isn’t. In fact, it couldn’t be simpler! If you’d like to really unlock the full nutrition of your oats, you can go ahead and mix the oats, water, and lemon juice in your pot the night before- this overnight soak not only makes it simpler in the morning, but it makes the oats easier to digest and unlocks the nutrients. In the morning, all you have to do is dump everything else in the pot and heat on medium high heat until it boils, then lower the heat to a simmer and let it cook for about 25-30 minutes until it’s thick and creamy. For my kids, I’ll add a generous pat of Kerrigold butter, or a swirl of cream to cool it down (and cross it over- see the Trim Healthy Mama book review for what that means). 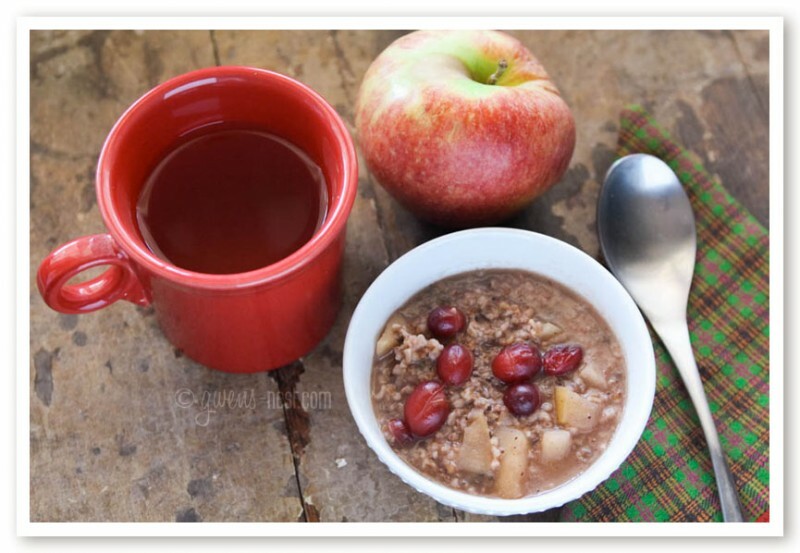 For me, I enjoy this steel cut oatmeal recipe with a cuppa Cinnamon Red Hots tea, and half of an apple.If I want to thin it or cool it, I’ll use just a splash of almond milk, and it’s perfect. 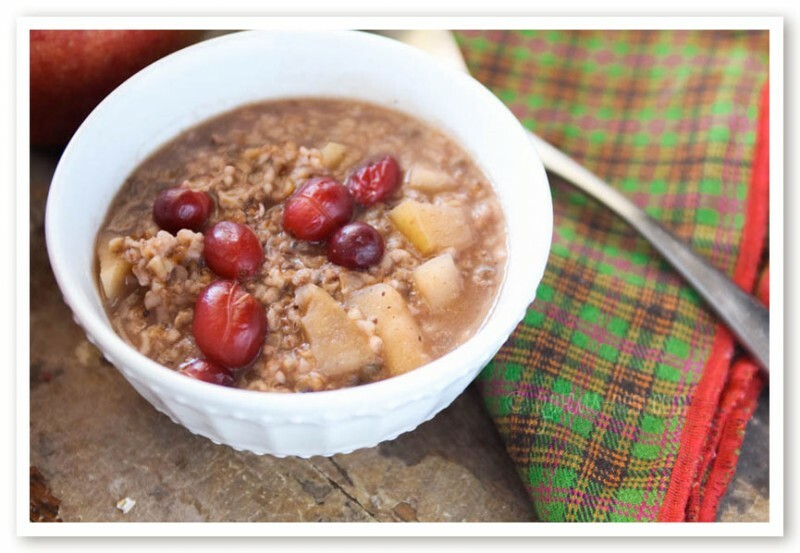 The warm, sweet oats and the pop of the tart cranberries is just so amazingly good that I have not yet gotten bored with this version of oatmeal. THM note: that makes my breakfast a healthy E meal! 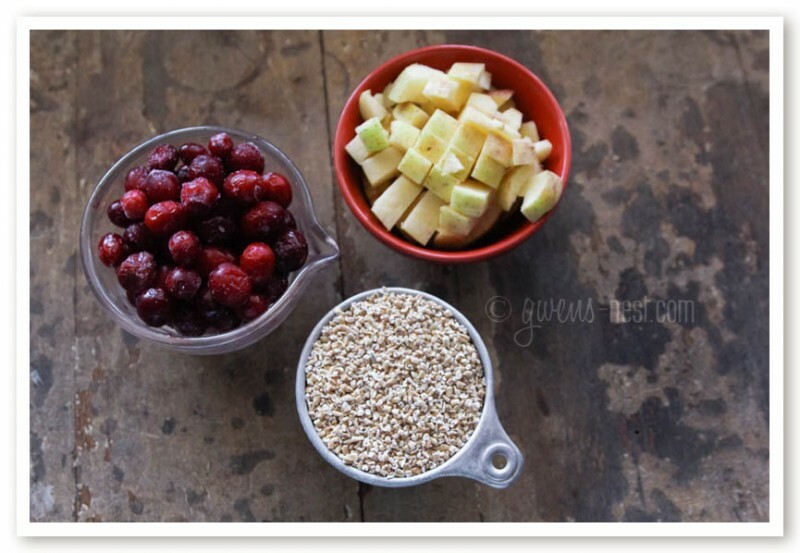 Perfectly sweet and tart- this is one bowl of oats that I actually enjoy and crave. The instructions are for steel cut oatmeal recipe, but I'll tell you how to use regular old fashioned oats in the notes. Enjoy! To Toast Your Steel Cut Oats- optional, but adds some depth of flavor- heat up your dutch oven over medium heat and add a teaspoon of butter. 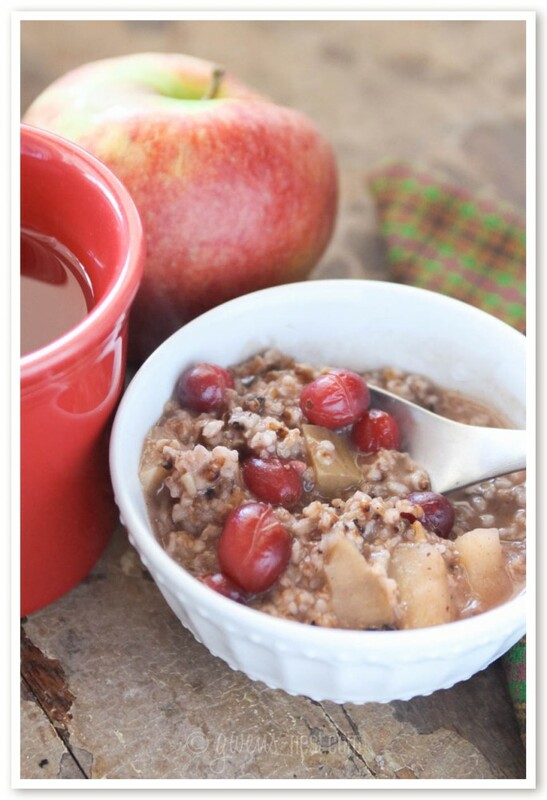 When it sizzles, add the oats, and stir until lightly toasted with a pleasant toasty aroma. 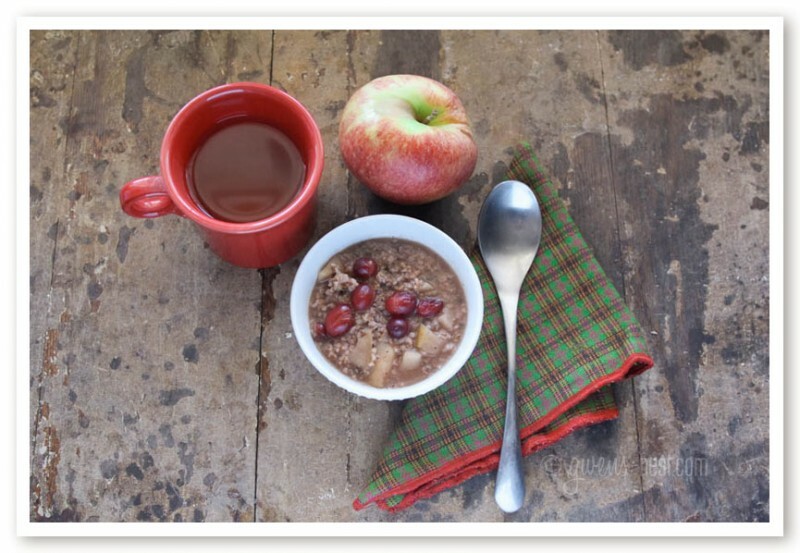 To Soak- Soaking enhances the nutrition profile, and makes oats easier to digest. It also saves a step the next morning. If you want to toast your oats, do that step first. All you have to do to soak is to add the oats, water, and lemon juice in your enamel or non-corrosive pan and let sit overnight. If desired, you can toast and/or soak your oats as directed above. Then add all remaining ingredients to your large dutch oven, and heat on medium high until boiling, stirring occasionally. Reduce heat to medium low and allow to simmer for 20-25 minutes, stirring more toward the end as it thickens up. I like to reheat the leftovers for a super fast breakfast the next day. To use regular old fashioned oats, increase oats to 4 cups. Bring to a boil, and then reduce heat and cook/stir for 5 minutes. Cover and let sit to cool for several minutes before serving. This is a Trim Healthy Mama E friendly recipe. I like to cross it over for my kids by adding a splash of cream or a pat of healthy Kerrigold butter. To stay in E territory, I enjoy mine with half of an apple, and my favorite cinnamon red hots tea. 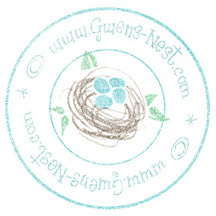 Forgive me, Gwen but the oatmeal looks a bit watery in your beautiful photos. I’m guessing the cranberries give off some liquid as well? I’m curious as to why you didn’t try almond milk. Almond milk is sort of just an illusion of creamyness to me, since it contains 99% water. So I choose to just use water instead and save my $. 🙂 But you’re welcome to add in almond milk as a sub for some of the water. I made 1/8 of a batch for me before committing to a full batch, as my family is not big on oatmeal. I’ve found my new favorite E breakfast. I don’t do well with just oatmeal for breakfast, so I eat it with a high-protein mocha trimmy light. It tastes like a cheat, but I feel great all morning. The drink is just the lower fat version of the hot cocoa trimmy from the new cookbook with coffee for the liquid, 1 scoop of collagen, and 1/2 scoop of whey protein isolate. Oh, the coffee trimmy sounds YUMMY! So glad you enjoyed the oatmeal! I always do better with added protein as well. How much can we have for a serving. I have to really watch my carb intake. Thank you, it looks divine! I stick to a cup. 🙂 If you are touchy with carbs, I’d add some lean protein in the meal. Can I toast the oatmeal and THEN soak overnight? Or would the soaking negate the toasting? Thank you! I have enjoyed several of your recipes. So I have just finished the book, and was hoping to figure out how to eat oatmeal as an E … Where is the protean all meals are supposed to be centred on? Am I not seeing it, or do oats have enough on their own? Oatmeal has a small amount of natural protein, and many people find that it’s fine to occasionally enjoy it alone for breakfast. Or you can pair it with another FP protein source, like a Frappe or Big Boy Smoothie. I do much better with higher protein myself, so I add egg whites into the oatmeal. HTH!